This video from Royal Caribbean shows the conveyance of Anthem of the Seas which took place on 10 March 2015. Just like the facts about the Anthem of the Seas docking out event video, this too contains some facts and figures about the event that started at the Meyer Weft Shipyard in Papenburg (Germany) in what the producers have terms a “Vinfographic” – a video infographic. At 11.00am local time the conveyance process began with Anthem of the Seas guided by two tug boats. Due to the size of the ship the process could only have taken place if the wind speed was less than 20 knots and if there was a full or new moon. At 2.40pm the ship made the tight squeeze through Lock Papenburg with zero clearance on either side. At 3.10pm power was cut from overhead cables so that they could cool sufficiently to contract and rise, allowing Anthem of the Seas to pass beneath with just 1.8 metres of clearance overhead, which the video claims is the average size of a baby giraffe. The reference to a baby giraffe could be cryptic confirmation of the identity of the animal sculpture on Anthem’s top deck – as suggested weeks ago by our own Captain Greybeard. At 9.05pm the ship passed Weener Bridge with 2.95 metres of clearance on either side and then at 11.45pm the ship passed Leer Bridge. At 3.05am the ship finally slipped through the Ems Barrier at Gandersum. The entire journey covered 20 miles (32 kilometres) and took 17 hours – seven hours longer than planned – equating to an average speed of between just two and three knots. 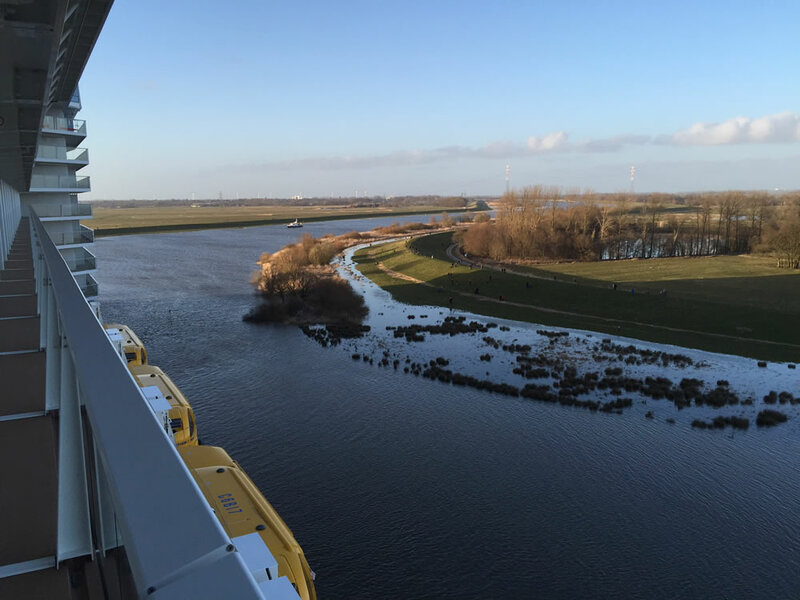 What makes this process of conveyancing even more breathtaking is that the whole thing was done in reverse – Anthem of the Seas had to navigate the River Ems backwards to ensure she remained centred and ensure the propellers were protected. A traditional infographic was released prior to the event and this can be seen below.